As you can see Android is treading over the market and capturing the huge market share by enticing the people and users by its features and flexibility. 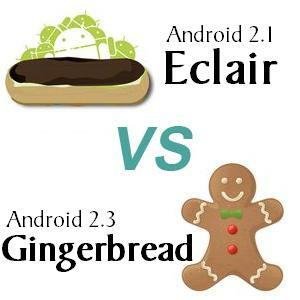 Now you can see the difference between two Android version-Android Eclair and Gingerbread. This blog post will help you to understand the difference between two major Android versions and will help you to opt the suitable one as according to the criteria of your particular or specific demand. Android Eclair was released by the Google in the early January 2010 as the other major Android Gingerbread was released in the December 2010. People can opt any flavor by picking up any of them. Now you can decide through each description about Eclair and Gingerbread- what makes the difference? Eclair 2.1 from Android provides the better, improved experience as compared to the last version Android Donut 1.6.Improvements in the Eclair version includes improved speed, ultimate screen size resolution and contrast ratio, Google maps 3.1.2, HTML 5 support, MS exchange Server integration, Flash for camera and Bluetooth v2.1 functionality for the better user experience. Along with the bunch of new features and functionality live wallpapers were also introduced and included for the first time for catching the eye-slice. Even the front end also upgraded more significantly as five home screen were provided instead of three along with the home screen navigation becomes easy as it was updated for easy access. With the new Android app launcher experience with Android has become smoother. New default widgets were available for the home screen as well as third party applications for 3D photo gallery which shows your pictures or photos in a slick scrollable viewing style so that you can feel amaze. Gingerbread 2.3 from Android introduces many new features and functionality for the better or enhanced user experience with full multimedia environment so that you can enjoy technology advancement at the fullest. Gingerbread technology offers new API’s for the developers community so that they can present or develop incredible yet interactive applications with large enhanced screen, improved processor speed and vast memory to develop astounding gaming experience. Android 2.3 Gingerbread also include a refined UI interface, enhanced keyboard, copy and paste, immense support for video playback as well as Internet calling and Near field Communication (NFC). Android OS includes features like WI-Fi hotspot, Adobe Flash 10.1 and multitasking. Android 2.3 has also integrated some apps into the platform like YouTube, Twitter, Facebook, MySpace etc. Internet being the core of communication in the current scenario, so Android 2.3 offers immense supports for SIP video & audio calling. Gingerbread has ability to handle or manage power management as well as efficiency to manage applications and process effectively. We have provided a comprehensive study of both the latest Android OS and thus helping you choose the best depending on your requirement and usage. Its all up-to you as you need to decide-To be or not to be!